The perfect pop of color made by colorful crayons! There are oh-so many ways to make your own lip balm/stick with a plethora of tutorials already available. 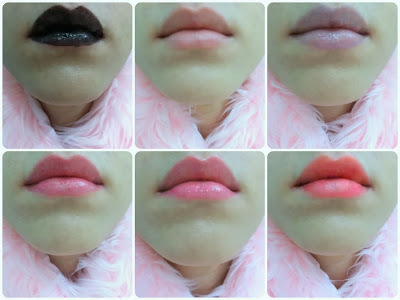 Mine's based on a super simple DIY Lipstick Made Out of CRAYON tutorial by Madisradd, which only requires two ingredients; a crayon and coconut oil. Except, I decided to add some vanilla extract for an extra hint of sweetness. Essentially, the general guideline is to use half a teaspoon of coconut oil for every inch of crayon. For reference, here's our How To: Repurpose Lip Balm Tubes in case you plan on reusing your own container to store the lip balm. As for the colors, from left to right, I used (1) an unidentified Black crayon, (2) an unidentified Maroon crayon, (3) Purple Mountain Majesty by Crayola, (4) Red Violet by Crayola, (5) Razzle Dazzle Rose by Crayola, and lastly (6) Wild Wacky Watermelon by Rose Art. In the mean time, I must say that I'm rather satisfied with how each lip balm came out with the exception of the Maroon; as for I was hoping of a deeper shade. For the future, I'd love to include a spectrum of colors of greater variety.